All of the Hunter Douglas horizontal blinds carried by Closet Works are precision crafted from genuine hardwoods — or from realistic wood alternatives and sleek aluminum. The beauty and high quality of these custom window treatments ensures many years of enjoyment, plus outstanding value. Horizontal blinds are ideal for windows that are taller than they are wide. In addition to standard rectangular windows, these horizontal blinds are available in many specialty shapes such as arches, angles, circles, ovals, bay or corner windows, sliding glass doors, french doors and cut-outs. The possibilities are endless. Fine woods and timeless design are the hallmarks of the Parkland® line. 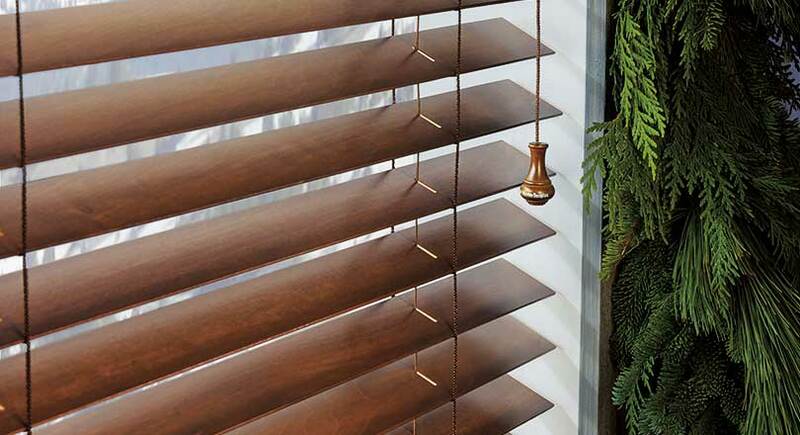 Traditional styling and rich hardwood slats allow these wood blinds to complement any room. The Parkland® line offers four collections of horizontal blinds — Classics™, Scenic™, Textures and Wirebrushed. Each collection offers different colors and textures, so you can find just the right design for your home. No matter which collection you choose, the advanced finishing technology will provide maximum protection and beauty. Operating systems for Parkland® include: PowerView®, LiteRise®, SimpleLift™, UltraGlide®, Standard Cordlock. Slats: 1-3/4", 2" or 2-1/2"
Parkland® Hardwood Blinds in Basswood with Standard Cordlock operation. Parkland® blinds are available in a multitude of colors. All are made of Basswood except for the Textures collection, which features African Abachi timber. See your designer for a complete listing of color samples. This smart alternative to wood blinds has classic good looks that don't age. Available in realistic TruGrain® finishes or a large selection of solid colors, and with operating and decorative upgrades available. 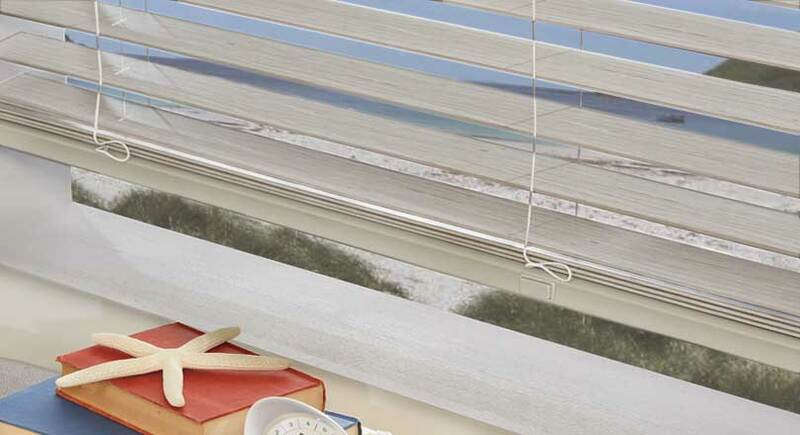 These blinds are made from a durable PVC formulation. They're guaranteed against fading, yellowing, warping or bowing — which makes them perfect for the humidity of your bathroom or rooms with full sun. Available operating systems for EverWood® and First Edition™ include: PowerView®, LiteRise®, SimpleLift™, UltraGlide®, Standard Cordlock. EverWood® Alternative Wood Blinds with TruGrain® finish and SimpleLift™ operation. Everwood® Alternative Wood Blinds are available in a wide assortment of solid colors and realistic wood grain finishes. The budget friendly First Edition™ collection of window blinds is available in a limited pallete of whites and off-whites. See your designer for color samples. These sleek, thin aluminum slats offer maximum light control with a clean, uncluttered look. For total light control, certain metal blinds feature de-Light™ — a feature that hides cord holes and blocks light more efficiently. On the other hand, if extra light is what you are after, consider MagnaView® — an exclusive tilt operation available on Modern Precious Metals® blinds. Tilted closed, it looks like a traditional blind; tilted open, it reveals twice the view of an ordinary horizontal blind while increasing incoming light. Available operating systems for Modern Precious Metals® include: PowerView®, LiteRise®, SimpleLift™, UltraGlide®, Standard Cordlock. Louvers: 1/2", 1" or 2"
Modern Precious Metals blinds with PowerView® operation. Enjoy special finishes and textures, from metallic to pearlescent to matte, and a wide range of attractive hues. Metal slats can be paired with real wood accents for a striking look — or mix and match colors to create something totally unique. See your designer for color samples. Hunter Douglas Horizontal Blinds from Closet Works are available with either motorized operation or one of several different manual operating systems. Your choice of operating systems for Hunter Douglas horizontal blinds includes: PowerView® Motorization, LiteRise®, SimpleLift™, UltraGlide®, or Standard Cordlock. All horizontal blinds are available with any of these operating systems. The PowerView® Motorization system can be integrated with many Smart Home systems. Please see the following video for an explanation of the various operating system choices for Hunter Douglas horizontal blinds. Vertical blinds are ideal for wide window expanses and sliding glass doors. These custom-made vertical blinds offer smooth, quiet performance and are available in a range of fabrics, as well as vinyl, aluminum, wood and alternative wood materials. 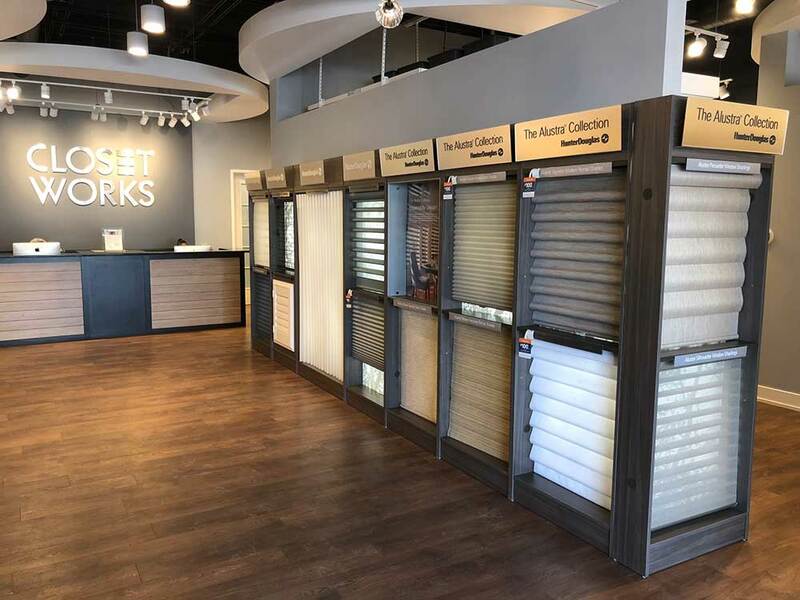 Closet Works offers the widest selection of Hunter Douglas vertical blinds, with hundreds of materials and colors available. Skyline® Gliding Window Panels are a patented twist on panel track blinds. Crisp, clean and modern, they are a sleek, contemporary panel that lends modern drama to any décor, whether covering large windows or when used as a unique sliding room divider. Operating systems for Skyline® include: PowerView®, Wand Control, Continuous Cord Loop. Skyline® Gliding Window Panels in Neptune. 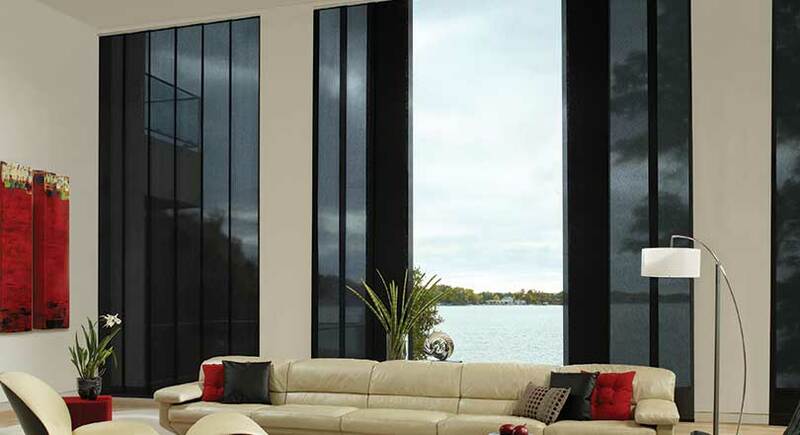 Skyline® gliding window panels are available in an extensive assortment of fabrics and colors. Additionally, Skyline® Panels are also offered with the Alustra® Woven Textures collection — an exclusive, design-inspired line of fabrics, textures, colors and hardware finishes. See your designer for a complete listing of samples. Cadence® Soft Vertical Blinds feature curved louvers, mimicking soft drapery folds and offering elegant styling and translucency. Attention to detail is the hallmark of all Hunter Douglas window treatments and Cadence® is no exception. 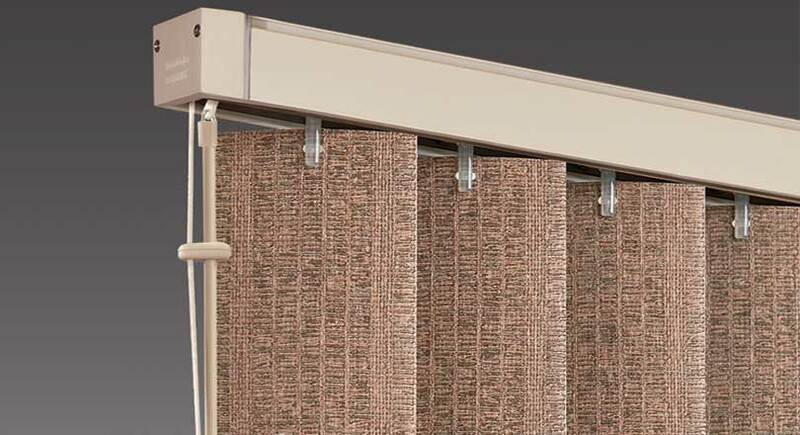 The patented headrail design on these blinds reduces light gaps and allows smooth, trouble-free operation. Operating systems for Cadence® include: Chain & Cord, Wand Control, Combination Wand/Cord Control. 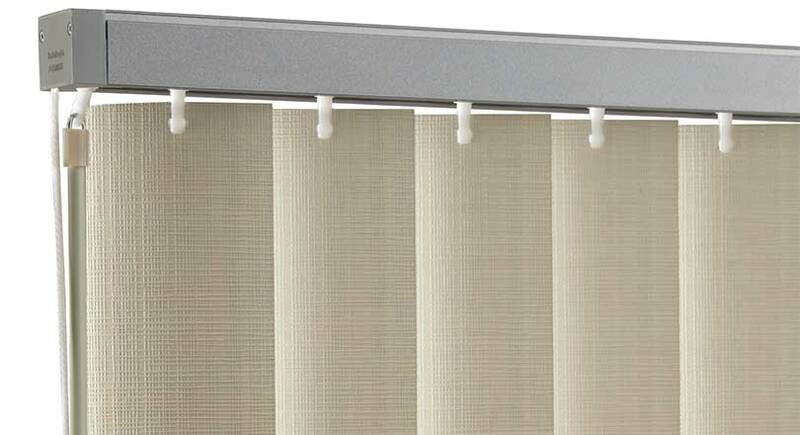 Cadence® Soft Vertical Blinds in the Regal fabric. 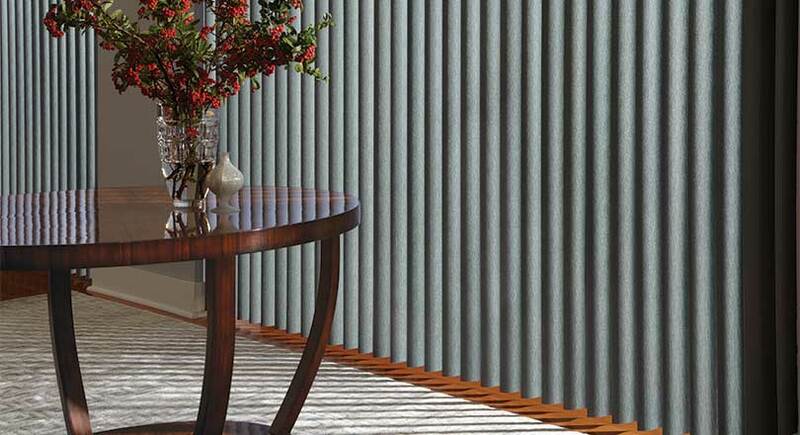 Cadence® soft vertical blinds are available in nine different fabrics and a large assortment of colors. See your designer for a complete listing of samples. Somner® Custom Blinds offer the largest selection of colors, treatments and textures of any vertical blinds window treatment available from Closet Works. Selections include everything from smooth metal finishes to geometric patterns. 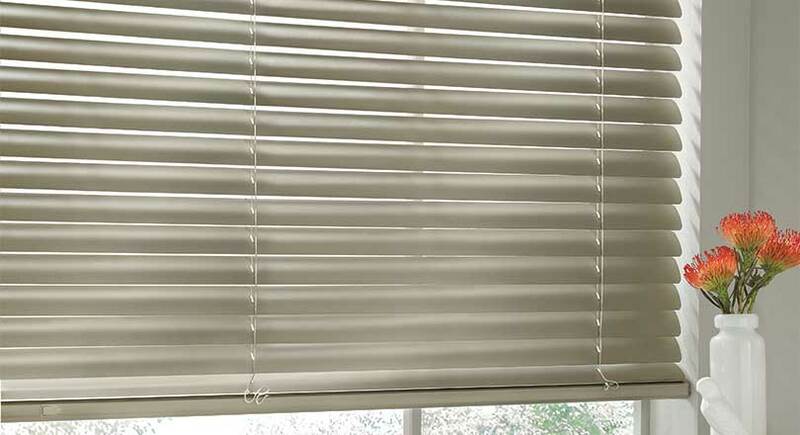 Available in fabric, vinyl and aluminum, these blinds feature easy operation and superior light control. Operating systems for Somner® include: Vertical Motorized System, Chain & Cord, Wand Control, Combination Wand/Cord Control. Somner® fabric blinds with wand control. Somner® custom vertical blinds are available in vinyl, fabric and aluminum with an extensive choice of textures and colors. See your designer for a complete listing of samples. Vertical Solutions® are an economical assortment of popular 3-1/2" louvered vertical blinds. They come in a large assortment of colors and textures, with material offerings spanning many fabrics and vinyls. Operating systems for Vertical Solutions® include: Vertical Motorized System, Chain & Cord, Wand Control, Combination Wand/Cord Control. Vertical Solutions® fabric blinds with wand control. Vertical Solutions® custom vertical blinds are available in vinyl, fabric and aluminum with an extensive choice of textures and colors. See your designer for a complete listing of samples.